Roof vents on RVs can damage over time, requiring the replacement of the vent covers. Usually only the covers need replacing, not the entire vent. Plastic vent covers deteriorate with the heat of the sun. They can also break from powerful hail storms. A vent cover can easily be replaced. Secure a large ladder next to your RV. Lean it at an angle so it is firmly resting up against the trailer. 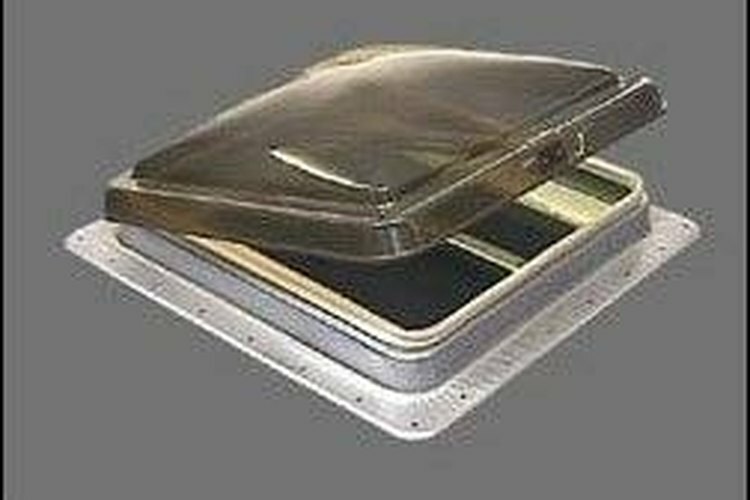 Be sure to purchase the proper 14-inch-by-14-inch replacement cover by taking a picture of your old cover hinge to your local RV replacement parts store for comparison. The hinge will determine the type of cover you will need. Remove the pins in the hinge. Each brand has a different type of hinge style, but they all require the removal of the pins in order to remove the old cover. Straighten out the tabs that insert into the vent and remove the lid. Add the replacement cover by reversing the procedure. Insert the tabs on the cover into the RV roof vent and replace the pins into the hinge. Some covers have a screw on each side of the hinge. If your cover has these screws, you will need to remove them before removing the old cover, and screw them back in place after the new cover is positioned. Be careful if you are climbing up onto the top of your RV to replace the vent cover. Make sure someone is around to help you in case you fall.